Today: Sunshine, warm temperatures, and a few passing clouds will be the story around the region on Sunday. After a cloudy, showery day on Saturday, the sunshine will return to the entire region this afternoon. The sunshine this afternoon will cause temperatures to be warmer as well. The Rogue Valley and northern California will see temperatures in the upper 60s to low 70s today while the coast and Klamath Basin will see temperatures top out in the upper 50s to mid 60s this afternoon. Tonight: The warmer day today will lead to a fairly mild night coming up. Most communities around the region tonight will experience partly to mostly cloudy skies overnight with temperatures a few degrees warmer than last night. The Rogue Valley and Northern California will see temperatures bottom out in the low to mid 40s tonight. The Klamath Basin will experience overnight low temperatures in the mid to upper 30s tonight. Coastal communities will stay mild in the mid to upper 40s this evening. Extended: We look to stay fairly quiet into early next week with the storm track mainly staying to our north. Temperatures will be rising too with parts of the Rogue Valley potentially reaching the low 80s by Tuesday. We'll keep an eye on shower and thunderstorm chances later in the week, especially, for areas east of the Cascades and in Northern California. Temperatures will also cool off a bit late week. 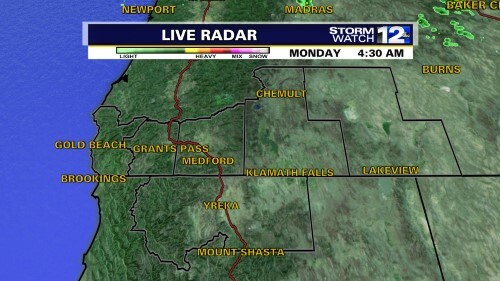 Stay up-to-date on the forecast with StormWatch 12 on-air and online. Stay with StormWatch 12 for updates on your forecast on-air and online...Much colder today behind the cold front. We've caught a break from the precipitatoin this afternoon, but look for more rain and snow showers to return to the area starting as early as this evening, especially, west of the Rogue Valley. Another storm system will increase the coverage of rain and snow into tomorrow and keep winds gusty throughout the area. A WIND ADVISORY is in effect for 8 AM-11 PM Friday for the Shasta Valley in Siskiyou County with possible wind gusts up to 50 mph. East of the Cascades, Eastern Klamath & Lake Counties are under a WIND ADVISORY from 11 AM to 11 PM Friday with gusts up to 50 mph. As another surge of moisture moves into the region tonight into Friday. Snow levels will be low and the snow will be heavy for our higher elevations including the higher and lower mountain passes. Look for snow levels to drop down below 2,000' tonight. Through the day on Friday, heavy snow expected in our higher elevations. Snow levels will rise somewhat between 2,500'-3,000' in the afternoon with the daytime heating. The valleys and coast will see mainly rain, some of it heavy. Some thunder is even possible along coastal areas. Conditions will really start to deteriote into tomorrow evening as snow levels drop and temperaturs cool. Look for a changeover to snow all the way down into most valley locations Friday night. Some slushy, minor accumulations are possible in the Rogue Valley, mainly 1" or less. WINTER STORM WARNINGS & WINTER WEATHER ADVISORIES have been issued for much of the viewing area for tonight through Friday evening. Our higher elevatons could see as much as 1-3 feet of snow, especially, for the coastal mountains and western Siskiyou Co. mountains. Lower elevations between 2,000 to 4,000 feet could see between 3-6" with as much as a foot of snow. By Saturday morning, the snow will have cleared out, but another storm system will bring rain and snow chances to the coast through the day and eventually working east into the Rogue Valley, Cascades and Siskiyou Co. through Saturday afternoon. Temperatures will remain cool and we'll likely see some more snow showers Saturday night into early Sunday.